Angel Falls (Spanish: Salto Ángel; Pemon language: Kerepakupai Meru meaning "waterfall of the deepest place", or Parakupá Vená, meaning "the fall from the highest point") is a waterfall in Venezuela. It is the world's highest uninterrupted waterfall, with a height of 979 metres (3,212 ft) and a plunge of 807 m (2,648 ft). 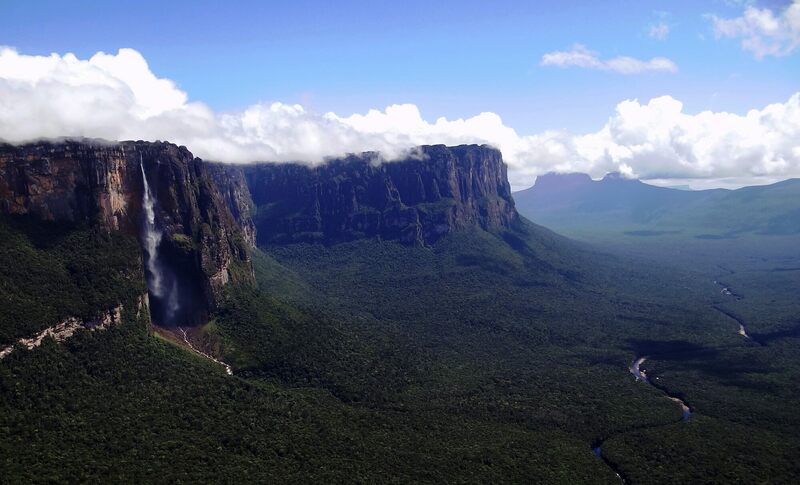 The waterfall drops over the edge of the Auyán-tepui mountain in the Canaima National Park (Spanish: Parque Nacional Canaima), a UNESCO World Heritage site in the Gran Sabana region of Bolívar State. The height figure, 979 m (3,212 ft), mostly consists of the main plunge but also includes about 400 metres (1,300 ft) of sloped cascade and rapids below the drop and a 30-metre (98 ft) high plunge downstream of the talus rapids. The falls are along a fork of the Rio Kerepacupai Meru which flows into the Churun River, a tributary of the Carrao River, itself a tributary of the Orinoco River.